A little less than a year ago, Google merged Google Voice functionality into Gmail and made it possible to place VoIP (voice over IP) phone calls directly from within Gmail to any mobile phone or landline. Now, Google is making Gmail voice calls more appealing by expanding the program to an additional 38 countries around the world, and lowering rates at the same time. The initial Gmail voice calling was only available within the United States and Canada. Calls placed to numbers within the United States and Canada are completely free (and will remain so for at least the remainder of 2011 according to Google), and calls placed to other numbers around the world could be made at rates starting as low as two cents per minute. 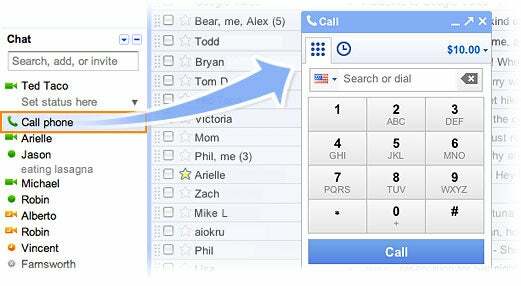 Call mobile and landline numbers using Google Voice directly from within Gmail. A post on the Official Google Blog this week announced that Google is taking the Gmail voice calling feature global. It is adding 38 languages, expanding the types of currencies accepted as payment, and lowering the per-minute calling rates to over 150 destinations around the world. Google calling credit can be purchased using US dollars, Canadian dollar, British pounds, or Euros--no yen, yuan, or rupees in there yet. Billing addresses within the EU will be charged the applicable VAT rate when purchasing calling credit. The Google blog post explains, "We're rolling out this feature over the next few days, so if it's available in your country you'll see a little green phone icon show up at the top of your chat list and you'll be ready to make calls (you'll need to install the voice and video plug-in if you haven't already)." Google Apps users need to have Gmail voice calling configured and enabled by the IT admin. The Google Apps domain administrator must enable Google Voice and Google Checkout in the administrator control panel in order for users within that organization to be able to use this feature. Google Voice and Gmail voice calling put Google head-to-head with Skype--which is being acquired by Microsoft. That means that Google and Microsoft will compete directly for business and consumer VoIP calling just as they do for email and office productivity. If your organization uses Google Apps, or you use Gmail on a personal level, check out Gmail voice calling and see how it works for you. One word of advice, though--get a USB headset to use or all of your calls will be like speakerphone calls.